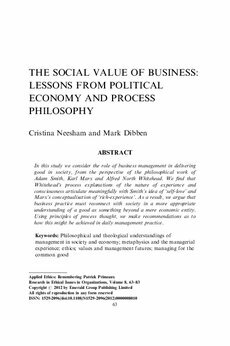 In this study we consider the role of business management in delivering good in society, from the perspective of the philosophical work of Adam Smith, Karl Marx and Alfred North Whitehead. We find that Whitehead’s process explanations of the nature of experience and consciousness articulate meaningfully with Smith’s idea of ‘self-love’ and Marx’s conceptualisation of ‘rich-experience’. As a result, we argue that business practice must reconnect with society in a more appropriate understanding of a good as something beyond a mere economic entity. Using principles of process thought, we make recommendations as to how this might be achieved in daily management practice.